What Does the Bible Say about Holy Communion? I’m so glad you asked because this is one of my favorite subjects, mainly because it is so practical. You’ll see what I mean by the time I answer this too infrequently asked question. As usual in these FAQs, my relatively brief answer is elaborated upon in our audio teaching: Eat, Drink and Remember. 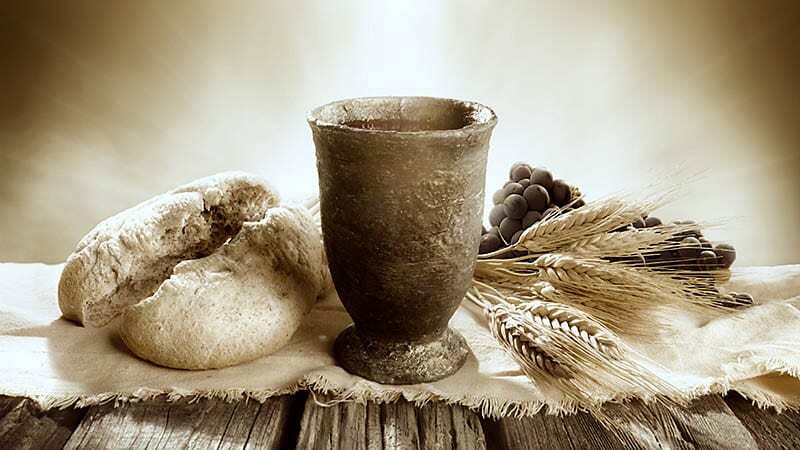 It seems that why the ceremony with bread and wine is called holy “communion” comes from 1 Corinthians 10:16 in the KJV: “The cup of blessing which we bless, is it not the communion of the blood of Christ? The bread which we break, is it not the communion of the body of Christ?” The Greek word translated “communion” is koinonia and it means a full sharing. In English, we can see that the word “communion” denotes “union with,” i.e., oneness, and that is most significant, as we will see. There is the biblical metaphor that compares believing the Word of God with eating. Think about it—to take into your mind the written Word of God to the end that you act upon it is similar to taking into your body food and drink. There are many examples of this figurative analogy in Scripture, such as: “Taste and see that the LORD is good…” (Ps. 34:8a); “My people…have forsaken me, the spring of living water…” (Jer. 2:13a); “‘My food,’ said Jesus, ‘is to do the will of him who sent me and to finish his work.’” (John 4:34). The one we will look at in more detail is “…I am the bread of life…” (John 6:35). Now let’s think about what it is to eat or drink. Picture it: you and a candy bar, you and tofu, you and a bag of chips, whatever. What are your options? (1) Walk away and receive neither the benefits nor the consequences of ingesting and digesting it. (2) Put it in your mouth, chew it, and spit it out—again receiving neither good nor bad from it. (3) Chew and swallow it, receiving either the benefits or the consequences of its ingredients. Which of those three would you say is making a total commitment to the item? Yes, number three. Stomach pumps aside, when you swallow something, you are “one” with it from then on. Who invented eating and drinking? Right, God did. Do you enjoy eating and drinking? Did God make any delicious stuff to eat and drink? What happens if you do not eat and drink? Right, you expire. Have you noticed that most folks get that and do anything it takes to get food and water? Many prisoners of war have reported eating bugs, snakes, shrink-wrapped airline “food,” etc., just to stay alive. Now then, what if God had made all the food we need to eat in order to survive taste terrible? We’d eat it anyway, right? Sure, because the alternative is death and we are programmed to try to stay alive. How awesome of God to make that which we absolutely must do in order to stay alive the thing we love to do! Do you think that last statement has any relevance to spiritual matters? Sure it does. Believing the Word of God is absolutely necessary to get born again and have everlasting life, and believing and obeying it is absolutely necessary for our lives today and for the rewards we’ll receive when the Lord Jesus appears. And, walking with God and the Lord is delicious! There is nothing more satisfying than obeying God and seeing Him keep His promises to us. OK, back to the Bible—John 6. In verses 1–15 here’s what happened: Jesus came upon a company picnic where everyone forgot to bring lunch. Taking advantage of this opportunity to give his disciples a pop quiz, he asked them what they could do to feed the crowd estimated at 5000 folks. They flunked, saying, “No way.” Someone did have five small loaves of bread and two small fish. Jesus told the disciples to have the people sit down on the grass, took the bread and the fish, gave thanks to God, and passed out fish sandwiches to everyone—as many as they wanted! And, they took home doggie bags to boot! But. what if you saw those words, went in to the restaurant, and found that they were serving furniture? Even with ketchup, a footstool is hard to get down. No, you want All you can eat to be tasty. There’s only one thing that could make it better and that is if it were also free. If you found such an eatery, would you go back? And what if when you did, you found they had moved across town? Would you give up and just go to some burger place? I doubt it. And then, in verse 35, Jesus clearly draws a similar analogy to what we saw in Matthew 4:4. He said, “I am the bread of life. He who comes to me will never go hungry, and he who believes in me will never be thirsty.” Shortly thereafter (vv. 51–58), he reiterates that he is the bread from God, and that whoever “eats his flesh” and “drinks his blood” will one day have everlasting life. A study of Hebrew culture shows that the idiom Jesus used (“eating his flesh, etc.”) refers to believing the words of a person. The “unworthy manner” in verse 27 refers back to the malpractices of verses 20–22, and in verse 29, the “Body of the Lord” refers to the Church, the believers. Almost unbelievably, verse 30 shows that the gluttony and withholding from some of the weak and poor had become so rampant that some of the believers actually died, apparently of malnutrition. Paul exhorts the Corinthians to exercise internal discipline in these matters and closes the chapter by saying that if people cannot behave properly at the Love Feasts, they should stay home. In giving his instructions at the Lord’s Supper, did Jesus really envision a daily, weekly, monthly, or yearly ceremony with wafers and grape juice? I don’t think so. I assert that he was encouraging his followers to remember him whenever they ate or drank. In that culture, bread and wine were two primary staples, and thus, he chose them as the food and drink. For the record, it is certainly not a sin to participate in a “communion” ceremony. In fact, it can be very meaningful, but let’s think about how practical it is to remember the Lord (and what he did, is doing, and will do for us) every time we eat or drink. As Christians, our goal is to practice the presence of the Lord Jesus in our lives, making him a part of whatever we do. On the other hand, Satan’s goal in the rat race of life is to steal our thoughts of God and Christ. Quiet prayer and Bible reading time are essential, but it is not always available to do that for hours in a day. Too often, it seems, “life” consumes us. I don’t know about you, but my mind has been distracted from the things of God way too many times in my life. But, has anything ever stolen my thoughts about food? Are you kidding? I take my last bite of breakfast and I’m thinking, “What’s for lunch?” How much of our daily thought time and our activities revolve around eating and drinking? A lot! Many Christians do pause to give thanks before they eat a meal, and that is a pause that refreshes. But, what if, via the proven principle of mental association, we make it a habit to think of and/or thank the Lord whenever we eat a candy bar at a highway rest area or stop at the office drinking fountain? Do you think that in the split second you focus on him he might give you a “thought from the Throne,” some insight you need at that moment? There’s certainly more chance of that happening than if you’re not thinking about him, right? And how edifying it is to dwell upon the love Jesus showed for each of us by going to the Cross and laying down his life for us. How wonderful to remember, amidst the din of life and all its pressures, that we each belong to the Lord as a vital part of his Body, that he is coming for us, and that in the meantime he is our life and is right here to help us become like him in this dying world. What a joy it can become to “dig in” to the life-giving Word of God and savor its nourishment. Doing so will remind us that we can always make a total commitment to the Word by chewing, swallowing, and digesting it to the end that it sustains us.